The morning of March 19 was business as usual, as U.S. Army Recruiting Command staff and civilians tended to their work supporting the recruiter. That all changed at 10 a.m., when the USAREC headquarters turned into a lifelike battlefield when two active shooter role players entered the building. Sgt. 1st Class Erik Ramos and Sgt. 1st Class John Ramirez, both at Fort Knox’s 4th Cavalry Brigade acted as disgruntled recruiters affected by ALARACT. Role players were brought in from outside of USAREC to help keep the operation a secret. Catching most employees by surprise, the two shooters went different directions looking for those in charge of ALARACT. They “shot” everyone they encountered. In all, there were nine “real world” casualties caught at their desks or in a hallway by the shooters. In the end, Ramirez and Ramos were “killed” by post military police during a showdown. He was pleased that most of the employees responded in the right way by locking doors, hiding, and staying quiet. Ebel and the Command Security Officer Robert Lesson were the evaluators that stayed with the two shooters. After the initial hostile engagement, Ramirez and Ramos knocked on doors pretending to be military police. Not one person opened their office door. “That tells us training is important and the active-shooter exercises are critical for the safety of our command,” said Ebel. As soon as Fort Knox 911 dispatcher received the first call, post police arrived on the scene and sealed off the immediate area around USAREC headquarters. The Fort Knox Fire Department and Emergency Medical Services set up a triage detail there. 4th Cavalry Brigade also provided eight “casualties” mocked up with moulage so the first responders got hands-on training in an active shooter response situation. 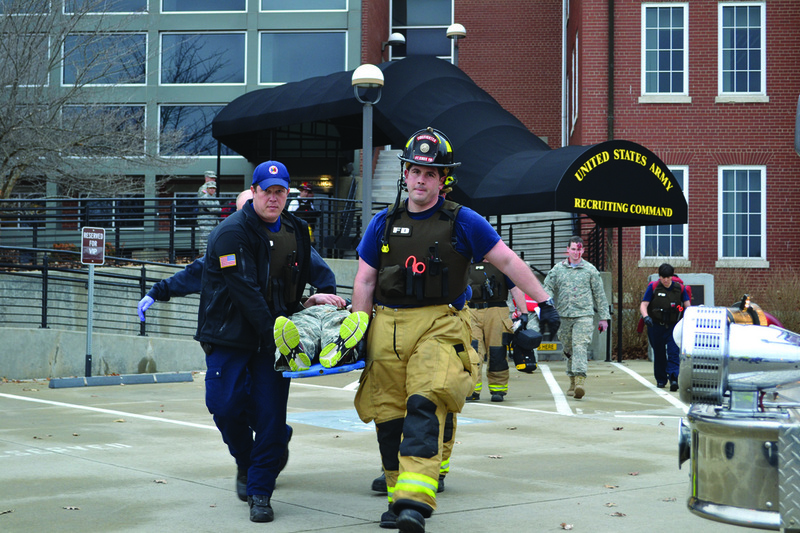 Deputy Fire Chief Jay Schiedewitz praised USAREC personnel for taking the exercise seriously. “I believe we accomplished our training objective today by making the workforce more cognizant of active shooters and the devastation the shooter can do in a short amount of time,” he said. U.S. Army Recruiting Command headquarters was the scene of a Fort Knox-wide active-shooter exercise Wed., March 19. Eight 4th Cavalry Brigade casualty role players were made up with moulage, so the Fort Knox first responders could train in evacuating casualties in an active-shooter environment. The scene unfolds with first responders evacuating casualties to the awaiting emergency vehicles. Pictured is Cpt. Joseph Nalli carried out on the stretcher.